An alarming, well-researched account of how the far-right extremist underground became empowered in the era of Trump. Journalist Neiwert (Of Orcas and Men: What Killer Whales Can Teach Us, 2015, etc.) 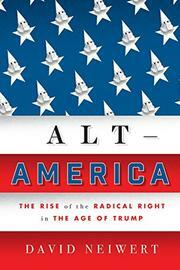 takes a long view, noting how “most Americans did not realize that far from going extinct, these groups had been growing and flourishing in recent years.” To explain this, he returns to the 1990s, “when the radical right first began to try to mainstream itself as a ‘patriot’ and militia movement.” The author documents how mainstream conservatives helped legitimize such groups while purportedly staying aloof from their bigotry. Simultaneously, a profitable right-wing media juggernaut fed the incivility and provided a constant stream of propagandistic viewpoints, barely checked following movement-related atrocities like the Oklahoma City or Olympics bombings. While militia culture declined during the Bush years, 9/11 ramped up a “nativist backlash…[alleging] that ‘white culture’ was under attack in the form of this ‘invasion’ of brown faces speaking foreign tongues.” As Neiwert notes, Barack Obama’s presidency unified the racist right and mainstream conservatism; their denial of his legitimacy inspired the “Birther” movement and, ultimately, Trump’s campaign. Concurrently, seemingly trivial online episodes like the misogynist “Gamergate” video game controversy were unifying disparate factions in the alienated, intolerant “Manosphere,” communicating through raunchy memes that normalized racism. The author further examines the rise of a young, media-savvy generation of online white supremacists and “academic racists,” who connected with Trump’s coded appeals to racial grievance. Ultimately, “the interrelated but often disputatious spheres occupied by the followers of these ideologies were united by Donald Trump.” The author documents a great deal of violence, committed by those influenced by the universe of bigoted conspiracy theory through which he guides readers. He writes in a clear, cool fashion, aware that this shameful political tale may signal a “potentially dangerous proto-fascist” future, the subject of his epilogue. A prescient discussion of one of the darkest issues facing America today.